Genie9 is a commercial developer of backup and cloud software solutions that was established in 2010. It has since been an internationally renowned company with the introduction of simple yet robust backup solutions, going on to win many awards. Since then, Genie9 has been one of the top leaders in its industry. Zoolz Intelligent is a cloud backup service powered by artificial intelligence. It's designed to help companies automatically protect, and structure Terabytes and Petabytes of files. Genie9 is a leading backup and security solutions company using military level encryption. 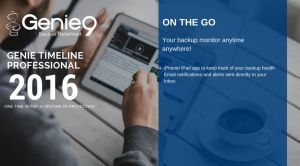 They have award winning backup products which provide seamless data and disaster recovery for home, pro and SMBs desktop, laptops and servers to local storage. The company started in Jordan and has now moved everything to the UK (IPs, HQ, and Business Development). Genie9 designs, develops, and markets their storage management and disaster recovery solutions. Additionally, they provide backup solutions to service providers. Some of Genie9's clients include NASA, Marriott, Siemens, Philips, the BBC and Columbia University. Genie9's edge is in its introduction of simple solutions to complicated problems with sleek, clear interfaces and intuitive wizard-based functionalities. Genie9 is also the developing company responsible for the very successful "G Cloud Backup" Android application. Genie9 is now looking to enhance their R&D whilst simultaneously investing in marketing and sales. Globally, most of the sales are from the US and Japan. They have released a new market disruptive technology called Intelligent Cloud, for which they have already signed huge deals in the past 2 months. Q. I guess £34,500 is net profit generated in the UK? What are the profits from overseas operations? Q. What was the reason for the considerable increase in admin expenses in 2016? "Zoolz Intelligent is a cloud backup service powered by artificial intelligence. It's designed to help companies automatically protect, and structure Terabytes and Petabytes of files."